With summer just around the corner, a lot of us switch their work out routine to swimming. A lot of swimmers can improve their endurance as well as their breathing capacity through targeted training of the respiratory muscles. This has been clinically shown in studies. UB researchers conducted the study at the annular (doughnut-shaped) pool at the Center for Research and Education in Special Environments in Sherman Hall on the South Campus. At the University in Buffalo, swimmers had to follow a specific resistance-breathing training protocol. After training with this so called breathing load , they improved their respiratory muscle strength by 33%. Their underwater scuba swimming time improved by 66%. “Specific respiratory muscle training could allow divers in the military, civilian rescue services, commercial enterprises and sport to perform better underwater,” said Claes E.G. Lundgren, professor of physiology and biophysics in the School of Medicine and Biomedical Sciences and the study’s senior author. “Typically, we think it’s the muscles that move the body that are fatigued when we tire,” he noted. “However, the increased work load of the breathing muscles is very important, particularly underwater during prolonged or high intensity exercise such as swimming. “As shown by other studies, when breathing muscles become fatigued, the body switches to survival mode and “steals” blood flow and oxygen away from the locomotor muscles and redirects it to the respiratory muscles to enable the diver to continue breathing. Deprived of oxygen and fuel, the locomotor muscles become fatigued. “Increasing the strength and endurance of the respiratory muscles prevents their fatigue during sustained exercise, enabling divers and swimmers to sustain their effort longer without tiring,” Lundgren said. 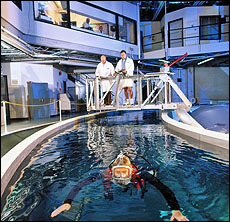 Participants also underwent baseline tests to determine pulmonary strength (maximal pressures they could generate), pulmonary endurance (time that a high ventilation could be sustained), VO2max (the maximal volume of oxygen they could consume per minute to produce energy for exercise) and length of time they could swim at a moderately high speed.